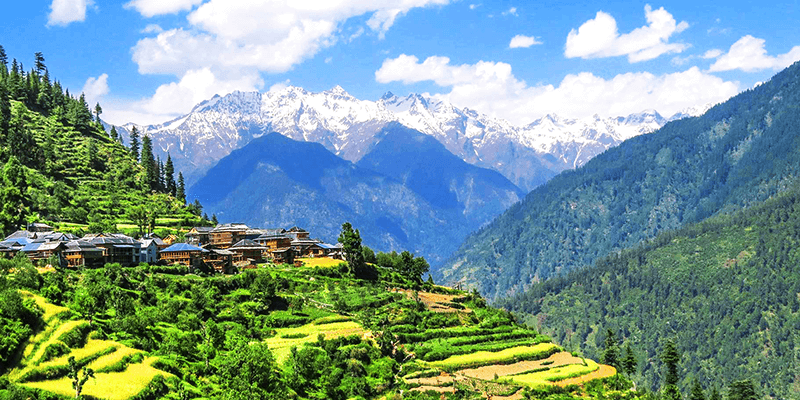 Want to experience the reason why tourists call Himachal Pradesh as nature’s bounty? Well, if that is your wish then you have to start looking beyond the usual Himachal Pradesh tourism trail. Most visited tourist places in Himachal Pradesh would always comprise of Shimla, Kullu and Manali tours. Problem is: these towns have become so touristy that somehow the tourists do not even get a glimpse of real Himachal Pradesh! If you want to soak in the true beauty of tourist places in Himachal Pradesh, then you have to start looking beyond Shimla or Manali tourism places. 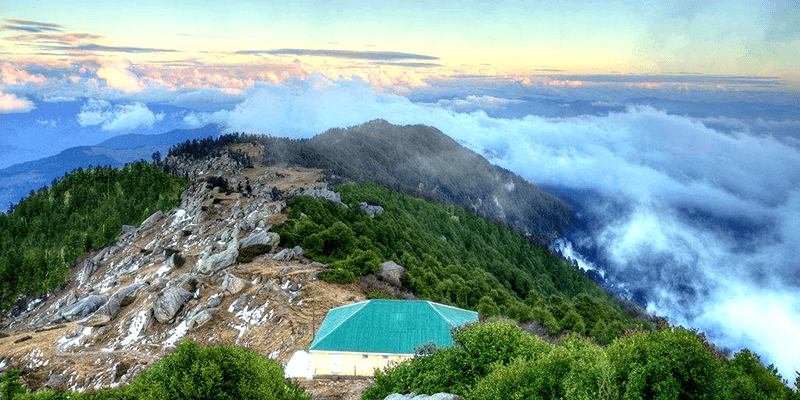 With that thought in mind, we present a list of Himachal Pradesh getaways that help you witness nature at its pristine best and enjoy the views of those snowy peaks and faultless landscapes. 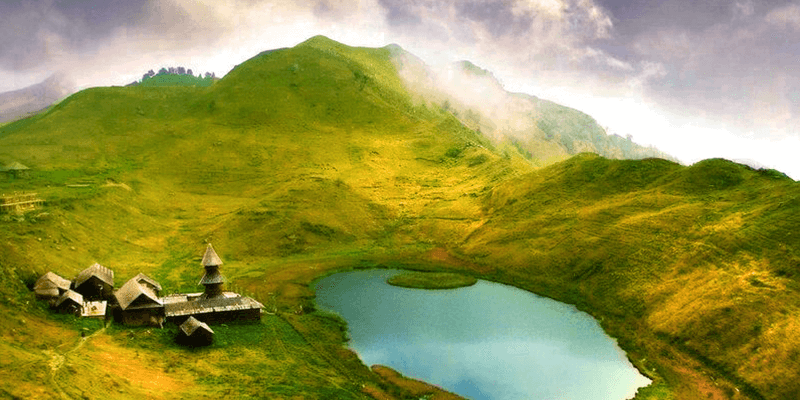 Here are some of the unknown tourist places in Himachal Pradesh. If you want to spend some days just lazing it out, then the quietest town of Jibhi would be a great travel destination. 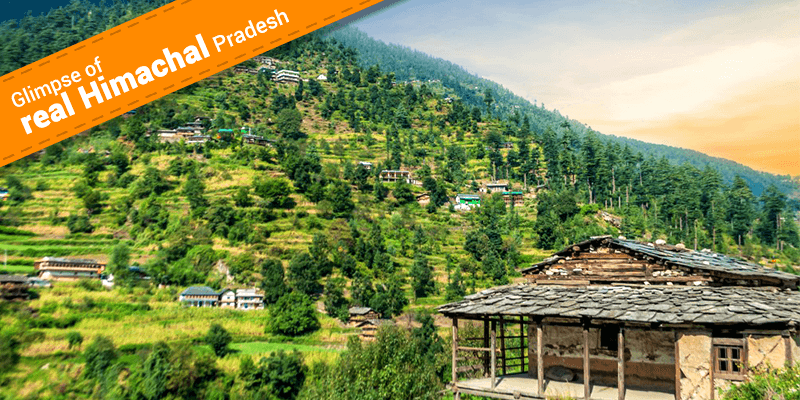 Jibhi is a little known scenic hamlet that appears when you approach Manali from Delhi by road. Jibhi is nestled in the Tirthan Valley and has rows of houses with the traditional Himalayan style of architecture. The landscape of Jibhi is blessed with green meadows and lush with pine or cedar forests. Jibhi is also a popular destination for Trout fishing and you can sit on the shores of gently passing streams to have a great catch! What’s more, there are many scenic attractions waiting for you nearby Jibhi. Jalori Pass: One of the foremost attractions of a Jibhi trip lies in visiting the Jalori Pass. It is one of the highest passes in Himachal Pradesh and the road is filled with many great vantage points which would bring out the shutterbug in you. You can anticipate views of now-capped Himalayan peaks and clouds floating between the Deodar covered lush green mountains while traversing this Pass. There are many trekking trails that start from this point. Seroyul Lake: As you traverse ahead on Jalori Pass you would come across a cross road. One road moves towards the Seroyul Lake, while the other takes you to Raghupur Fort. Let us first take a trip to the scenic Seroyul Lake. This is a holy lake and even has a small temple on its shores. You would find the locals offering ghee at this lake. The Seroyul Lake has a picturesque setting and you would definitely enjoy spending some time here. Raghupur Fort: As mentioned before, the other road leads you to Raghupur Fort, which is also known as Raghupur Garh. The road leading to this fort is filled with idyllic views. When you reach the fort, stay ready for amazing mountain views. Not much details are known about the history of this fort. Raghupur Fort has a small pond within its premises. Chaini Tower and Fort: 3-4 hour trek from Jibhi will reach you to the remote village of Chaini. Midway along the route you will come across the Sharingi Bagi temple. Take some rest at this revered site, before moving ahead and reaching the picture perfect village of Chaini. Chaini will welcome you with a fresh mountain breeze, lush Cedar forests and plenty of smiling faces of villagers. While at the village do take a look at the Chaini Tower. It is five storied structure that has brick walls and is reinforced by time logs. Tower is a perfect example of Himalayan architecture and even has a secret tunnel underneath. A bit ahead lies the impressive Chaini Fort, which holds 4-5 ancient structures. Chaini Fort might look like an imposing structure, but the locals will tell you that 2 storeys of this fort were destroyed in an earthquake. Situated in the Mandi district of Himachal Pradesh, at a distance of 140 KM from Shimla, Janjehli would win your heart instantly with its lush greenery and flawless beauty. The green meadows and scenic beauty are the top draws of Janjehli. This sleepy little town serves as a base for the popular treks to Chindi, Karsog and Shoja. One of the highlights of a Janjehli trip of course is the range of sightseeing options it presents. But while you visit this tranquil place do care to find a quiet spot, open a book, play some music and just get lost in the heavenly beauty of nature. Pandav Shila: Situated around 3 KM away from Janjehli, Pandav Shila is a mammoth rock that is believed to have been sitting at the spot since the Mahabharata era. There is a popular belief among the locals, that if you throw a pebble at this rock and it manages to stay on top than all your wishes will come true. Nature trail: While at Janjehli you would have plenty of options to explore the remote parts of the village. There are walks, cycling tours and nature trails available here. These tours take you through some of the most beautiful points of Janjehli. The next scenic delight on our menu is Prini. Prini is a beautiful village in Naggar and falls in the Kullu district. Sitting quietly amidst lush green valleys and snowcapped mountains, Prini welcomes you with dreamy landscapes and clear blue skies. Jagatsukh Road waterfall: Prini is known for an impressive waterfall on the Manali–Jagatsukh road. There is a makeshift bridge across the waterfall, which makes it easier for you to take a closer look at the cascading water. You will come across this waterfall while journeying to and from Manali. Just before the waterfall appears in front, you would come across acres of paddy fields that appear like a landscape portrait. Soon after you can hear the thudding sound of the waterfall from your car itself. Take a halt near the waterfall and enjoy the waterlicious breeze! 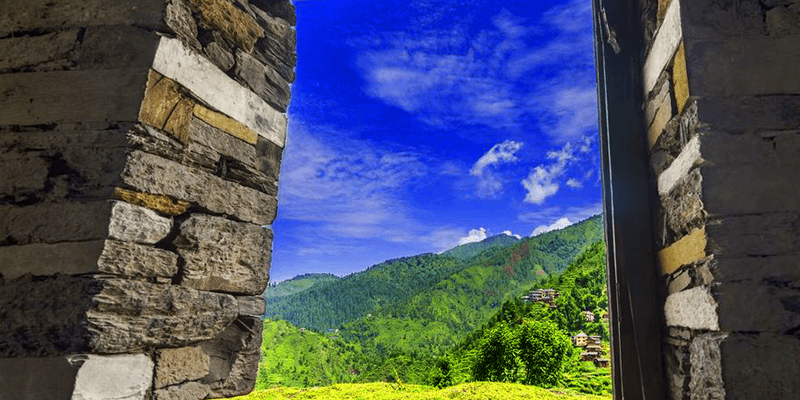 Naggar Castle: When in Prini, you must visit the Naggar Castle. The castle overlooks the beautiful Kullu valley. The castle was built around 1460 by Raja Sidh Singh of Kullu. Naggar Castle resembles the classic Himalyan style of architecture. As you enter this beautiful wood and stone made castle, you can actually feel many tales of the yore come alive and see paintings of Russian artist Nicholas Roerich. Naggar Castle has now been converted into a heritage hotel. With a slow-paced life and breathtaking beauty all around, Shoja is a small village tucked in sheer scenic vista of Himachal Pradesh. The scenic beauty of Shoja tranquilizes the soul. The wooden houses and a slow moving life here will be a welcome reprieve from the busy city life. Pine and Deodar forests coupled with snow covered mountain peaks stay etched in your memory for long. Located in the Banjar Valley, Shoja is home for many exquisitely carved wooden temples. Shoja Waterfall: Take a morning walk to the Shoja waterfall, which is about a kilometer away and does wonder to your senses. The water is cold and makes a gurgling sound, which is music to the ears. The walk to the fall is blessed with divine beauty! Great Himalayan National Park: Situated in the Kullu region, the Great Himalayan National Park is another place you can visit while in Shoja. It is at a short driving distance from Shoja. The park is home to over 350 fauna species. The national park is known to have a high population of Snow Leopards, Blue Sheep, Himalayan Brown Bears, Musk Deers and Himalayan Thar. Serolsar Lake: Serolsar Lake is a calm and serene water-body near Shoja. Decorated with tall trees on its shores and mountain peaks appearing in the remote distance, this is another scenic beauty. There is a Budhi Nagin temple near the lake. The goddess is known to be the guardian of this place and has a hundred sons. A trip into the unknown, bypassing the beaten trail would be the perfect way to plan your next Himachal Pradesh trip.